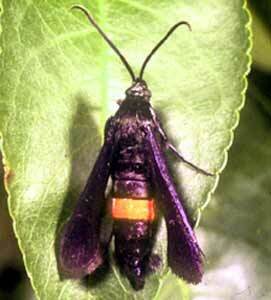 This photo shows an adult peach tree borer, a blue-black moth. The moths' inch-long caterpillars damage trees by boring into the bark at or near soil level. The first indications of its presence are small piles of sawdust around the base of the tree. Sometimes a gummy sap oozes from holes. This pest also attacks almond, apricot, flowering cherry, nectarine, and plum trees. Mature trees can tolerate some damage; young trees are most vulnerable. Peach tree borer is mostly a problem in California, but can occur wherever peaches grow. In spring, make frequent checks of tree trunks near the soil line for evidence of borers. If you find a hole, probe inside with a stiff wire to kill the caterpillar. After leaves fall in autumn, spray horticultural oil as directed on the product label. Encourage parasitic wasps by providing habitat.